Yes, there will be a plush. Loot Crate has given us a first look at the contents inside their Limited Edition Fallout 4 crate, a collaboration with Bethesda offering “rare and EXCLUSIVE gear and collectibles” from the Wasteland. 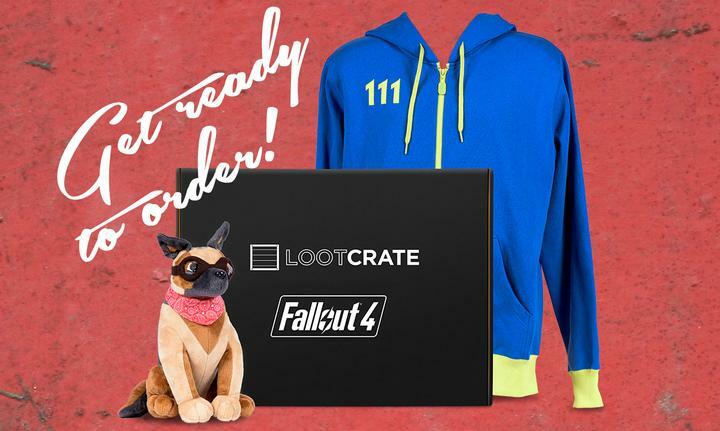 While most of the contents will be a mystery until orders arrive in November, the below image from Loot Crate shows a Vault 111 hoodie and plush Dogmeat are joining the loot lineup. The Fallout 4 Loot Crate is valued at over $150, and available for $100 including shipping and handling. Sales start tomorrow, Sept 23, at 12pm PST. The retailer warns that supplies will be limited, so you can sign up for a sale alert on the Fallout 4 Loot Crate page. Fans recently got a behind the scenes look at River, the German Shepherd playing Dogmeat in the upcoming Fallout 4. The video shares how much effort went into motion capturing every wag, sprint, and distracted sniff of Lead Level Designer Joel Burgess’ pup. Let us know if you’ll be ordering a Fallout 4 crate tomorrow down in the comments below, and for more, check out some of today’s top stories. Is This the Hardest Super Mario Maker Level Ever Made? Did Prima Just Confirm a Final Fantasy XII Remaster?